2017-06-17 Foot gear, socks and shoes have been a concern of mine from the beginning of my backpacking. When we went to "Jungle Camp" back in 1970 in southern Mexico they encouraged us to buy Vietnam Military Surplus boots. I'm sure I didn't select them well and had totally wrong socks, but I have vivid memories of painful feet with them. And for the most part I've always bought shoes either because of the way the looked or because they were cheap! And most of my life, most of my shoes hurt my feet! So when my son invited me on the Isle Royale trip with him and his daughters I was concerned. I read a good bit and watched some YouTube videos and went out and bought a "cheap" pair of low topped walking shoes. I only had a few days to get used to them but they felt good from the beginning and were a significant improvement over the Avia ones. they weighed 18 ounces per shoe but didn't think of that as a particular issue. On the 20+ miles of Isle Royale trip they served well. I had no specific discomfort though my feet were very tired at the end of each day. Merrell Hiking Boot. Weigh 1.7 lbs per boot, give excellent foot support and are waterproof. These Avia shoes had good tread, some leather structure in their upper and felt pretty good on my feet. And they were relatively light weighing 14.5 oz per shoe. But after walking in them for a while, especially with a pack I began to be concerned. My feet ached some (I learned later that I needed to switch out the insoles for some with some arch support) but the main thing I was concerned about is that I felt the rocks and unevenness in the trail quite a bit. The souls were not very rigid even though they did have pretty good tread. So just a few days before the hike went to Walmart looking for something more substantial. I came home with some 50-Peaks brand high top "boots". They offered more ankle support and the souls were considerably more rigid. And I could lace them so most of the downhill pressure was on my ankle instead of cramming my toes against the front of the shoe. 50 Peaks hiking boots. Weigh 1.1 lbs per shoe, give fairly good foot support. When we began talking about the trip in Glacier National Park I knew I needed to revisit shoes again. There would be considerable hiking on rough trails with many inclines and declines. Many of the downhill segments would be long meaning if my toes were cramped the result would be serious. So I went to REI and ended up bringing home a pair of Merrell Vibram waterproof boots. Thanks to the help the sales person gave me they fit perfectly. Frankly I love them. They give lots of stability, are truly waterproof, feel very good on my feet and have a wonderful tread. I only have one complaint, eich shoes weighs 1.7 pounds! As I get older (I'm 72 now) that adds up quickly. It just takes a lot of energy to lift and set down that much weight every step. So after our Porkies trip a few weeks ago I decided I had to do something. So yesterday I did something. I went back to REI and tried on lots of shoes. I've worn 9 or 9-1/2 shoes all of my life. Recently when I needed another pair of just plain old walking shoes I found that a size 10-1/2 felt much better. So in looking at on-sale shoes at REI I tried on some size 10, 10-1/2 and even some 11s to try to find one that was wide enough in the toe area for my feet. Finally the salesman, who had been very busy helping others before me said, let me measure your feet. That indicated that a 9 or 9-1/2 is what I needed. He then explained that people who need more toe area typically buy larger shoes but that puts the toe of the shoe out to far in front and makes the "hinge point" (my term) of the ball of the foot in the wrong place. That immediately made sense to me. Keen Hiking Shoes. Weigh 1 pound per shoe and have good toe width and seem to provide good foot support. Those 10-1/2 shoes I had recently bought felt great except they seemed to have a "lump" right under the ball of my foot! He then said the problem is width and unfortunately only a few hiking shoe manufacturers make wide toed shoes. That reminded me that before I bought those Merrell boots I had purchased a pair of Vasque boots. It only took a couple miles of walking to realize the toe area pinched my toes so I took them back and got the Merrell's which are considerably wider in the toe area, one of the things I loved about them. Long story shorter, I came home yesterday with the Keen's in a size 10. And this morning I took them for a three mile walk (no backpack) that included several sections of fairly steep inclines and declines. They felt really good, no squeezing of the toes, light to the step and gave very good foot support. Each shoe weighs 1 pound, just a bit less than the 50-Peak ones and a little more than the Avia ones with which I started this adventure. Hopefully that is a good compromise between weight and performance. Time will tell. Through all of this I have learned that shoes do make a difference! 2016-05-22 From watching YouTube videos I know there are more cook pot options out there than you can shake a stick at. I've got three myself pictured to the right. The left one is an Imusa 1200ml aluminum pot. The middle one is a 1200ml one I got on Amazon a long time ago. It is anodized aluminum with a smaller cup/pot/lid. The right one is a Stanley stainless steel mug/cup. I've played with all three of them and really haven't used any of them seriously on the trail or camping. That will change in the next few weeks as we have several trips planned. Measurement markings on the Stanley Cook Pot. One of the things I really like about the Stanley cup and which neither of the other two have are markings. 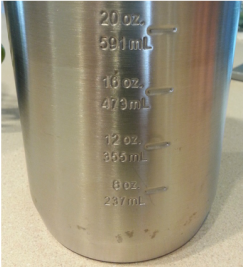 I wish they were in cups instead of ounces or milliliters, but at least it has them making it easy to know who much water you have poured into it. The other two leave it up to your ability to estimate or require you have some other means of measuring. It occurred to me that is a solvable problem! All I needed to do is make some "dimples" in my Imusa pot at one cup intervals and its done. 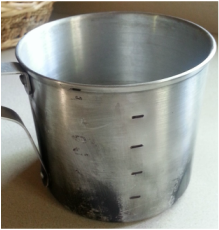 So I measured out and marked one-cup increments on the pot with a Sharpie. Indentations in the Imusa cup at one-cup intervals made tapping a screwdriver carefully. Then I took it to the garage and with it slipped over a fairly heavy stick clamped in my vice and with a flat screw driver and hammer made an indentation on each mark. The result? one quarter inch long indentations at one cup intervals on the inside, very similar to the ones on the Stanley pot. ​I tried to take a picture of the inside of the pot but just couldn't get one that was focused and well lighted. But believe me, the indentations are there! At first I didn't think I try it with the third pot as it seems to be made of a harder grade of aluminum. But I went ahead anyway. Turned out well. Now I have no excuse for fixing either too little or too much water for dehydrated meals whichever pot I use! 2016-05-21 On the short hike/walk today that my wife and I took in SENO Woodland area I carried fifteen pounds in the Mountaintop 35L+5L Hiking Climbing Backpack shown below. It was comfortable and served well. I especially like the webbed pockets on each side which easily accommodate various water bottles. 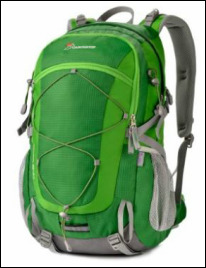 So back in January I ordered a Mountaintop 35L+5L Hiking Climbing Backpack from Amazon. It wasn't until a couple days ago that I actually used it. I took it on my SENO Woodland hike. It's small but I knew that. It doesn't have a hood which makes it a bit less versatile than a more serious backpack. But it is really light, seems fairly tough and does have several zipper pockets accessible individually from the outside. Also the web pockets on either side work very well to hold a water bottle or other things. The hip belt is pretty light weight but the shoulder straps are pretty well padded and it does have a chest strap. I had about ten pounds of stuff in it and it was completely comfortable. For $40 it seems like a reasonable pack for a light weight and a few hours. Loaded with 25 lbs on a long hike it might be uncomfortable since the hip belt is short and light. It is well ventilated and rests comfortably on your back. For my backpack I wanted something a bit more robust and larger, in the 60 to 70 liter size and comfortable with 30 to 40 lbs over a fair number of hours. So on a visit to our son's place over in Minnesota he and I went to the REI store near them to look at options. I tried the REI Flash series and a couple OSPREYs but didn't like the price. So I tried a Deuter Act Lite 65+10 backpack. I ended up buying it, partly because of the price but mostly because every time I put it on I liked the way it felt. The others weren't bad but somehow for me, I liked the Deuter one. I've used it for "training" hikes of 2-4 miles around our neighborhood a number of times with loads varying from 20 to 35 lbs and found it comfortable each time. The first real test will be in a couple weeks when I go on a short backpacking trip to Bong State Recreation Area with my ten year old grandson.